Rather than presenting a mystery horse for you to type, I'm going to share with you a story about how Five Element Personality typing helped two people and one horse develop perfect horse harmony. 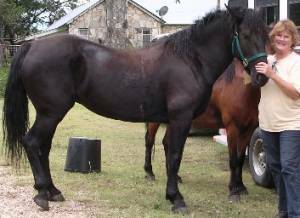 This is the story of Bella, a wild mustang with definite Percheron bloodlines adopted from the Bureau of Land Management as a yearling. Stephanie, Bella's first owner, was looking for the ultimate wild horse experience when she adopted the yearling. Wild horses were said to be tough and hard-working with plenty of stamina. Stephanie found that Bella had all of these traits. As a yearling and two year old, Bella was amazingly calm and tractable, and she clearly wanted to please. She could be ridden in parades and at public events, rarely reacting to the noise and chaos. She would willingly do almost anything asked of her, but would often become hesitant if she didn't understand the reason for doing something. She clearly needed to understand the "why" behind everything. Even so, her basic ground work and training under saddle went extremely smoothly. 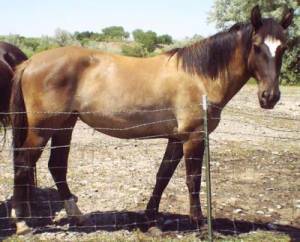 She developed into a beautiful draft mustang, complete with feathers, standing 15.1 hands. Late in Bella's third year and into her fourth year, Stephanie became interested in cutting, roping, and reining, and began working with a professional to train Bella for these disciplines. While Bella was willing to try all of these activities, it was clear that she disliked them all. She didn't enjoy anything that required speed or great agility, and had trouble moving her heavy body around. She also found lead changes difficult. At about the same time Stephanie was introduced to Five Element Personality typing. After reading through all the types, she determined that Bella was a Tai Yin type. Tai Yin horses are fond of routine, often prefer a single person, and have a sweet tooth. They can perform flawlessly but are not overly ambitious, often working more out of a sense of duty rather than competitive feeling. Stephanie realized that Bella was not a good fit for her chosen disciplines and decided to try to find her a more suitable home and occupation. Stephanie knew she had to find just the "right" person for Bella since Tai Yin horses are notoriously choosy about their humans. Enter Leta. After years of working with a Jue Yin "clown type" horse that was so mercurial that he could be a completely different horse from day to day, Leta was ready for a willing and gentle partner she could ride on her ranch and take for group trail rides. When Stephanie offered Bella, Leta was thrilled. In fact, Leta had made a list of characteristics she wanted in her new horse and Bella fit the bill to a tee. Bella, however, was less certain. Bella was so bonded to Stephanie that she felt "thrown away" and unappreciated when the transition to Leta's ranch in Texas was proposed. Through consistent animal communication, Leta and Stephanie were able to convince Bella to "give it a try," with the caveat that she could return to Stephanie if things didn't work out. The journey to Texas, both physically and mentally, went without a hitch. Bella adapted to her new home almost right away. Although she was not 100% bonded with Leta yet, she always came when called and wanted reassurance often. Leta describes Bella's feeling in the first few weeks as "standing back, just a hair, and evaluating everything before allowing her heart to go completely to a new person." Bella immediately fell in love with her new herd and the surroundings. The slight hesitance in the transition seems quite typical of Tai Yin horses. Today Bella has settled in beautifully on Leta's ranch. She loves the many acres on the ranch and the other horses in the herd, and continues to have a sweet tooth. Most of all, she has bonded with and now trusts Leta. The two of them have been on several group trail rides as well as many solitary rides on the ranch (sometimes accompanied by her beau Gabriel, a warmblood gelding). Once a week, Leta and Bella trailer to a nearby ranch for horsemanship lessons designed to deepen the harmony that already exists between them. Leta with New Tai Yin horse Bella! In recognizing that Bella, being a Tai Yin horse, would never be happy with the constant variety and change of all the different disciplines, Stephanie was able to prevent years of possible unhappiness and find Bella the perfect person in Leta. Stephanie now has a Wood horse that is delighted to do all sorts of competitive events-the more the merrier. In all cases these are truly matches made in heaven and happy endings of real horse harmony!